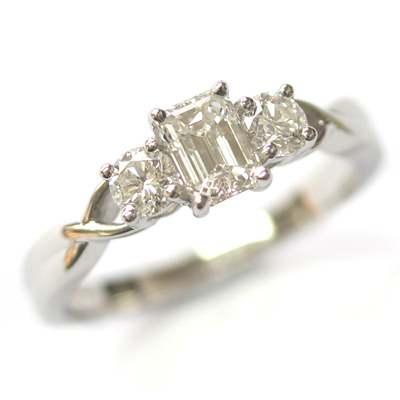 Emerald Cut and Round Brilliant Cut Diamond Trilogy Engagement Ring — Form Bespoke Jewellers Ltd.
A bespoke trilogy engagement ring with an emerald cut and round brilliant cut diamonds. 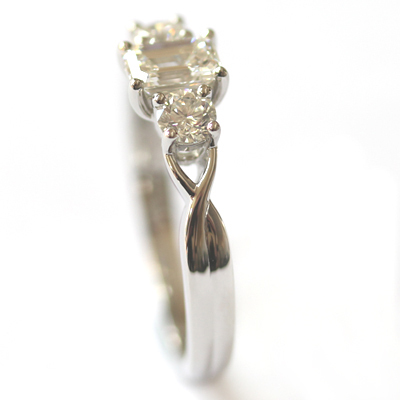 This pretty engagement ring design was created by the customer alongside the guidance of our expert jewellers. It showcases a beautiful bespoke crossover detail in the shoulders. 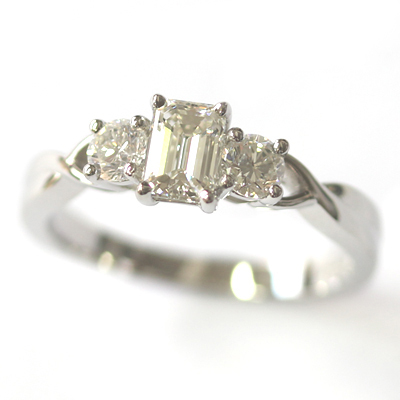 At the centre of the design is a bold, emerald cut diamond. Either side are two round brilliant cut diamonds of matching colour and clarity. This creates an interesting shape that flows beautifully into the twisting shoulder detail. The ring also has a double band illusion and is cast in platinum.